Once in a while you get an opportunity to be a part of a subtle shift in people, process, or technology that has major repercussions. Small spark. Big change. Read more on the next (r)evolution in the Tridion Technical Community (aside from the upcoming Tridion PowerTools release of course). Wait, you thought your participation in the Stack Exchange proposal was over? Dave Houlker proposed the site, we committed, but there's more to do. If you're not ready, (re)visit the 5 stages of Tridion grief, courtesy of Nuno (this week's he's Knew Know thanks to MVP chat). You can google Tridion answers. And a good deal of this, give or take the few things that have been brewing longer, happened within the last two years. Feeling nostalgic for WCM's roots or excited about the future? Read an excellent article by Tridion-founder Arjan van Rooijen taking about the past and future of the industry. Though I might be able to fathom the next two decades in WCM, my more immediate thoughts are on what the next two years will bring. And if if all of the above was old news for you, no worries, it will all change... again. In a good way, of course. Can we keep up as a community? Will we blaze the trail? 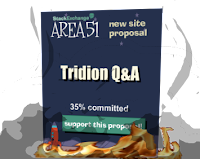 Committment to the Tridion StackExchange proposal means asking, answering, or even just editing (gardening) questions and answers. Help get us to the next phase and we'll see if we're actually catching fire. Flames courtesy of Stock Exchange. *I use "we" loosely--I've heard, seen, and know of lots of these points and news, but didn't make the magic happen. Credit for that goes to you, fellow consultants, implementors, customers, and SDL WCMS leadership.